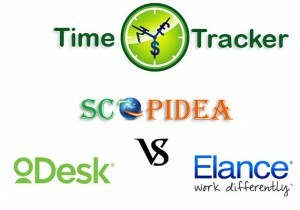 oDesk, Elance and Scopidea are perfect solution for remote team. These three times tracker software has some unique feature for your team need. 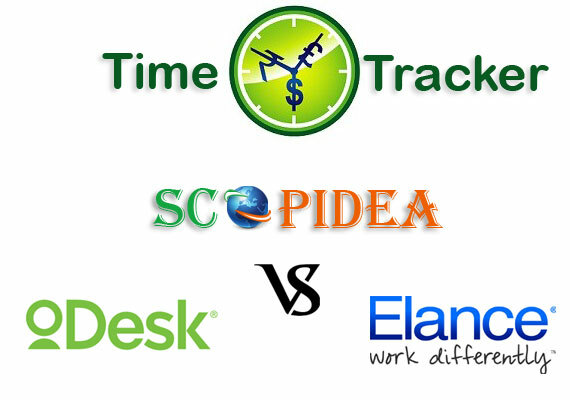 Scopidea, oDesk and Elance time tracker able to capture your employee activity and you able to see what going on your project. How much effort and focus is giving your one employee during work time. 1. oDesk charge employer 11% commission for every hour for Hourly work. Like if Client hire one developer with 10$ per hour, Client need to pay 11$ per hour 1.1 $ is oDesk fee. 2. Through oDesk time tracker, Client able to assign work to Team Members, it display in oDesk tracker under assign work. Employee/ Team Member are able to select assign task and start work. 3. oDesk time tracker able to capture system screen shots + working employee screen shots + keyword strokes and mouse clicks. 4. oDesk time tracker capture screen shots in every 10 min with random time interval, In one hour number of screen shots will be six. 5. Support platform Windows, MAC and Linux. 1. Elance charge 17% commission, it charges 8.75% commission form employer and 8.75% commission form employee. Like you have post 100$ project, employer need to pay 108$ and employee will get 92$ approx. 2. Elance time tracker able to capture only working employee system screen shots. 3. Through Elance tracker employer not able to assign work to team member. 4. Elance time tracker capture screen shots in every 10 min with random time interval, in one hour number of screen shots will be six. 5. Support platform Windows,MAC and Linux. 1. Scopidea time tracker able to capture system screen shots + working employee screen shots + keyword stroke and mouse click in number. 2. Scopidea time tracker, employer able to assign work to team member, it display in Scopidea tracker under assign work. Team Member is able to select assign task and start work. 3. Scopidea charge 3$ per user per month for tracking. It gives employer free project management software for 14 users. 4. Scopidea time tracker able to capture screen shots in every 5min or 10 min with random time interval. Screen capture time set by admin 5 min or 10 min, For 5 min it capture 12 screen shots and for 10 min Scopidea Time tracker able to capture 6 screen shots in every one hour. 5. Support Platform Windows, MAC , Linux and Unix.